Ryley Wealth Management Ltd (RWM), celebrating their 20th anniversary this year, have recently renewed their partnership with Nottinghamshire County Cricket Club into a second year. Established by David Ryley in 1999 with the vision to manage, protect and grow their clients’ wealth throughout their lifetime and for generations to come, RWM’s service incorporates all aspects of private and corporate wealth management. “As a company, our home has always been in Nottingham and, with many of our clients having an affiliation with cricket, we feel the exceptional hospitality and match day experience at Trent Bridge is second to none,” said David Ryley, CEO of Ryley Wealth Management. “But more importantly, the club’s values of giving back to the community of Nottinghamshire, to disadvantaged young people, are akin to our own and the reason we set up the 1% Matters Fund. 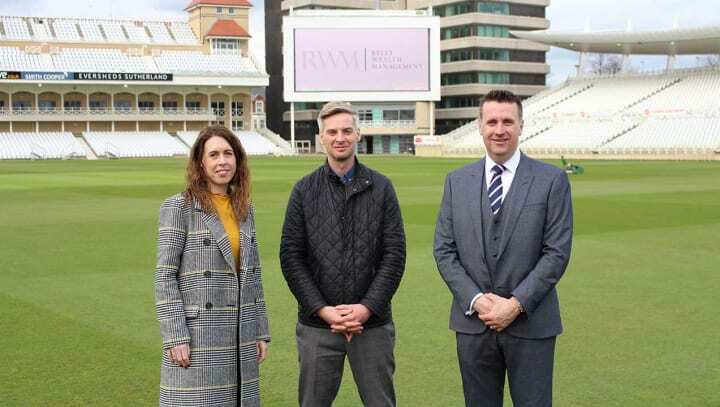 The partnership – which sees RWM’s brand appear at the Radcliffe Road end of Trent Bridge – has been welcomed by Nottinghamshire County Cricket Club’s Commercial Director Michael Temple. “Our partnership with Ryley Wealth Management is well established now and we’ve thoroughly enjoyed the time we’ve spent with their team at Trent Bridge,” he said. “We work best with Nottingham headquartered businesses that can take the time to use our venue, watch our matches and visit our restaurant and David and the team have been regular visitors here.